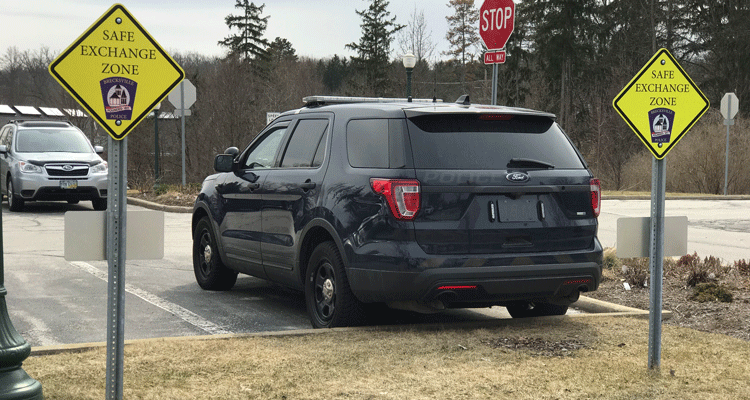 The Brecksville Police Department encourages residents to use our Safe Exchange Zone. The “Safe Exchange Zone” is two designated and clearly marked parking spots in the police parking lot intended to be used by those individuals who would like a safe and public location to make a child custody exchange or transaction when selling or buying items. Most parental child custody exchanges take place peacefully and amicably. There are those exchanges however that are not amicable and emotions run high. Knowing that the police department is seconds away often helps calm the situation and discourage problems. Individuals buying or selling items from strangers are strongly advised to use the “Safe Exchange Zone” to facilitate the exchange. We have all heard and read the horror stories of these transactions going horribly wrong. Making the exchange in a police parking lot will usually discourage those with bad intentions. The “Safe Exchange Zone” is a designated area where those exchanges can be made knowing the safety of the police department is just a few steps away if needed. The “Safe Exchange Zone” is available 24 hours a day and is used on a first come, first served basis. We do however encourage you to complete your exchange in a timely manner so as to make the spots available for others wishing to use them. There are two designated parking spots, one for each party making the exchange. At this time, the spots are not monitored 24 hours a day. If you have an exchange you are particularly concerned about, please contact the Brecksville Police Department at 526-8900 and advise them of the exchange.